I’m not going to say this is our recipe as it isnt. It is however slightly tweeked to make it even more perfect. We first experienced this in a hippy cafe in Newquay, its a must for a special campervan breakfast. • 75g/2½ oz of the butter in a saucepan and melt. Once melted, remove from the heat and set aside. • Place the egg yolks into a bowl set over a pan of gently simmering water (take care not to let the bowl touch the water) and beat until pale and thickened. Add the water, lemon juice, salt and freshly ground black pepper to the egg yolks and beat for another 30 seconds. • Add half of the remaining butter to the egg mixture in the bowl and stir for 1-2 minutes or until the mixture thickens. Remove from the heat and beat in the rest of the butter. • Slowly pour in the melted butter, whisking constantly, until the sauce reaches the consistency of double cream. Season to taste with lemon juice, salt and freshly ground black pepper. Keep the sauce warm by resting the bowl in a pan of lukewarm water. Make four slices of toast under grill and put some butter on. • Put your steamed spinach on your toast and grate some carrot over it. 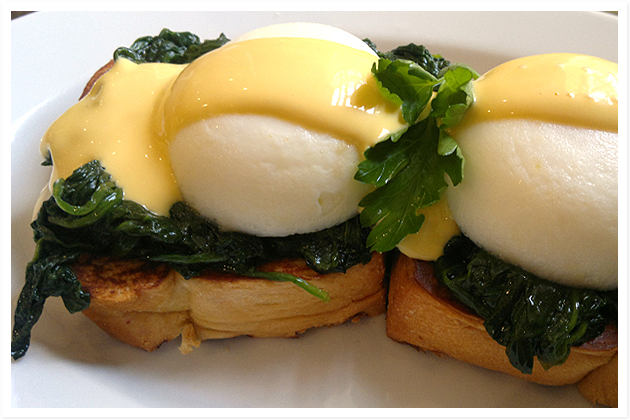 • Now place your poached egg on top and pour your Hollandaise Source on top. • Maybe a little black pepper and sea salt on top. • Your all done just split it between two plates.